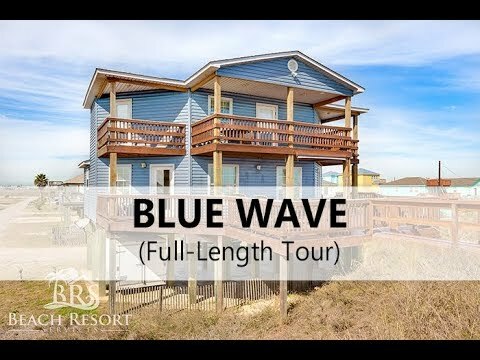 Blue Wave is a beautifully decorated Beach House that is located on the Middle Beach in Surfside Beach, Texas. When you arrive at the house, you will immediately notice that it was built right on the side of a giant dune! This gives the deck a natural walkout without having to walk down the stairs. It is a fun and unique feature that we have never seen before, but want more of it. Also offers a ramp which is accessible from the downstairs to the house and a ramp from the house out to the beach. Once you have reached the end of the walkover there are only a few steps out to the sand. After a fun day on the beach you will find an outdoor shower with both hot and cold water along with a small changing area so leave a fresh towel and change of clothes before you leave. Once inside, you will be able to immediately feel the love the new owners have put into the house. New flooring, bedding, furniture, paint and so much more. The home is warm, inviting and clean. On the main level, you will find the Living Room, Kitchen, Dining Room, Guest Bathroom, and 2 Bedrooms. Upstairs you will find the second Living Area with balcony, Half Bath, 3rd Bedroom with Private Balcony, and Master Suite with Private Balcony, Private Bathroom, TV, and for Additional Sleeping Offers 2 ottomans that convert to twin fold-a-ways. Safety features, 3 Fire extinguishers/ 3 escape ladders and in the kitchen has a mini fridge.